Weasel's Journey: What's for dinner: Minnesota Wild Rice Soup. 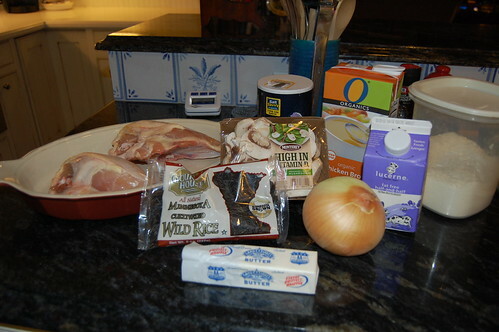 What's for dinner: Minnesota Wild Rice Soup. My husband, Robert, loves soup. He is not particular about his soup, is perfectly content to open a can of Campbell's for his lunch or dinner (though his favorite, and Will's, is my Corn Chowder). I also enjoy a bowl of soup, especially on a cold day, but I only like homemade soup. And not all homemade soup is created equal. 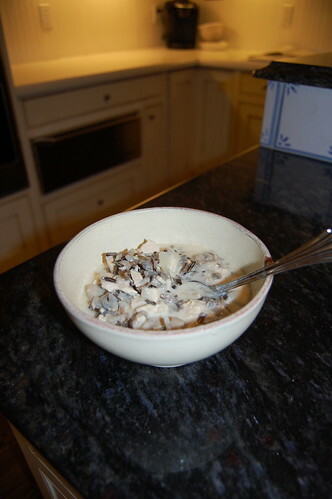 This recipe for Minnesota Wild Rice Soup came from a friend of my mother's in Jackson Hole who hails from Minnesota. My mother made it for us over Christmas, and I loved it so much that I had her send me the recipe. This is now my favorite soup, and I've made it several times since Christmas. Last night I prepared the wild rice in my pressure cooker which really saved time. Sauté mushrooms and onion in butter until tender. Blend in flour and gradually add the four cups of chicken broth. Stir in rice and salt, then add chicken and mushrooms. Simmer about 5-10 minutes. Blend in half-and-half and heat to serving temperature (do not let soup boil after adding half-and-half). My mom's friend Cathy added to enjoy this soup with hearty bread, seasonal fruit and some really great friends! I also want to put in a plug for my latest favorite app. My friend Bevy at It's a Golden Day told me about Paprika, which bills itself as a recipe manager. I have downloaded it on my iPhone, Mac desktop and iPad and linked them so that they stay synced through Paprika's "cloud." Paprika has a built-in browser that makes it easy to import recipes from sites like Epicurious and Food Network, and it also has a clipboard feature for copying recipes from blogs or other online sources. I love its grocery list feature that lets you check off the ingredients you need from recipes you've selected and then makes a list that is organized by produce, canned goods, meats, etc. I usually compile my list on my iPad or computer but access it in the store via my iPhone. Emailing recipes from the Paprika app is easy as well. You must purchase each Paprika app separately so I tried it on my iPad for a while before deciding to buy the apps for my iphone and computer too. If your eyes are better (younger) than mine, you could probably get by with just the app on your phone! Okay, my stomach is growling as I read about this soup. I'll have to try it - thanks for the recipe! Eloise i just made this soup for our dinner tonight and it is wonderful!!! I already tasted a little bit to see how it was and I was blown away. We lived in Minneapolis 2 years ago and I was given a big bag of wild rice before I left "to remember MN by" and I finally got to use some of it!! I've been nervous about using it till I saw this recipe. I was SO easy and yummy! You never let us down in the recipe department!! Thanks again! Valentine Luncheon 2012, part III. Valentine Luncheon 2012, part II. Valentine Luncheon 2012, part I.